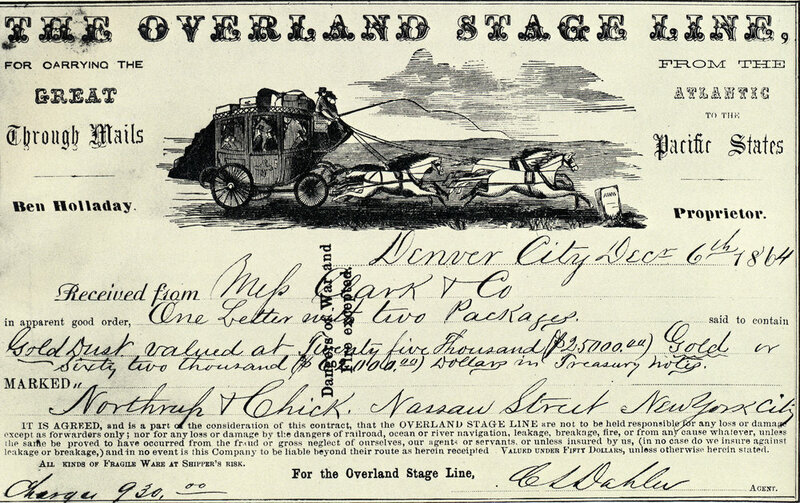 Subsidized by government contracts, stage lines, such as Wells Fargo and Company began carrying passengers as well as mail into the Western United States in 1840. Stage coaching quickly became the most elegant form of transcontinental transportation. While there were many bandits who sought easy money by robbing stagecoaches, none had as much dramatic flair as English born Charles Earl Bowles, better known as Black Bart. Bowles conducted a series of successful stagecoach hold-ups throughout Northern California and Southern Oregon during the 1870’s and 1880’s. Bowles, terrified of horses, conducted his robberies on foot, was always courteous and used no foul language. He wore a long linen duster coat and a bowler hat, covered his head using a flour sack with holes cut for the eyes, and brandished a shotgun. These distinguishing features became his trademarks. 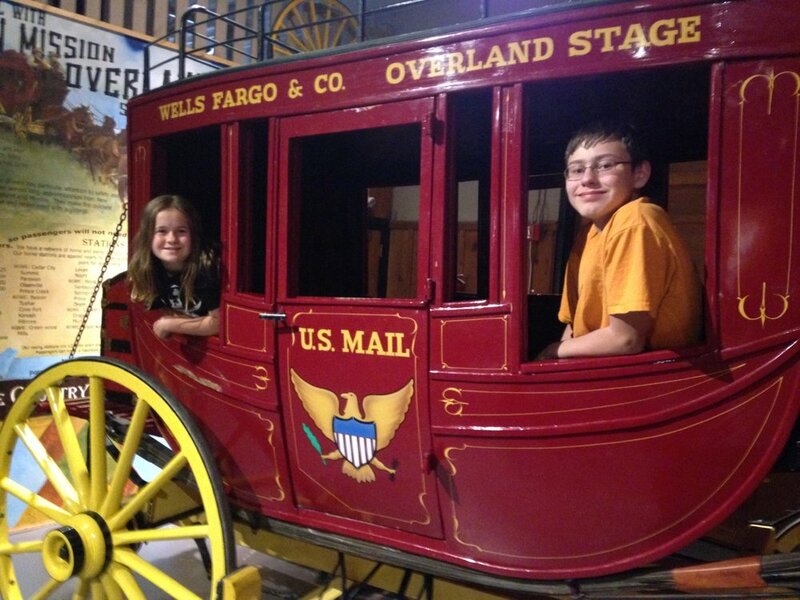 One of the most exciting pieces in our collection is our Wells Fargo Stagecoach. The coach, made in the Concord style was crafted by Gronway Parry, whose restored wagons and farm equipment formed the bulk of our collection in 1973 when the museum opened. Parry built the stagecoach in the 1950’s and it has been used in parades, movies, and television. The Parry coach is the only replica in our collection. We invite our visitors to climb about and imagine themselves on their own stage journey across the West. Just be sure to watch out for Black Bart. The first anglo settlers of the Cedar Breaks region used the fertile meadows for grazing their sheep and cattle and the large stands of evergreens for lumbering. Many of these families came from the British Isles and the area soon became known as Little Ireland. These families worked and lived together cooperatively establishing a thriving dairy operation. Each housewife took one day to take the morning and evening milk and make one batch of cheese. During the course of the summer, the women could produce 2000 pounds of cheese, which would be transported to San Francisco for sale. As the knowledge of the spectacular scenery of southern Utah began to spread early in the 20th century, tourist camps were developed in the Zion and Bryce Canyon regions of the state. Although the beauty of Cedar Breaks was widely known, access proved to be very difficult. The terrain of Cedar Mountain was a challenge for the horses and wagons, but nearly impossible for the automobile. The first car reached the area via the wagon road up Parowan Canyon in 1919. Cedar City residents Gronway Parry and Frank Seaman lobbied the Utah Department of Transportation to construct a road connecting Cedar City to the major north/south Highway 89 via Cedar Canyon. The state refused and in 1922 Parry and Seaman decided to take matters in their own hands. Taking their wives, and Gronway's car, Parry and Seaman began to blaze a trail through Cedar Canyon and over the mountain. Clearing away rocks, trees, and brush they slowly carved a road that would become State Highway 14. Once convinced that a road could actually be constructed, the State of Utah got involved and completed the project, and in 1923 cut a dirt road from the Midway point into Cedar Breaks. Many families from Parowan summered in Little Ireland and in 1921 Charles Adams built a crudely constructed boarding house to provide workers with shelter and food. He placed his married daughter Minnie Adams Burton in charge and the structure became known as “Minnie's Mansion.” The “Mansion” had a large dance floor and a kitchen and dining room in the rear. “Minnie's Mansion” soon became the summer social center for the citizens of Parowan. Some came by wagon or on horseback to enjoy a Saturday night dance with a local band providing the entertainment. Rodeos and summer holidays were also popular in the cool mountain surroundings, sometimes with fireworks set off over the Breaks. As the residents of Iron County began to promote their local tourist spots, the Federal government developed an interest in the area. Tensions between the U.S. Forest Service and the National Park Service had been growing throughout the 1920's and centered upon differing ideas of land use and management. The Forest Service adopted a multiple use approach that managed the land for its resources – wood, water, and grass as well as wildlife habitat and recreation. The Park Service viewed itself as the nation's foremost custodian of American heritage – mandated by Congress to preserve, protect, and provide visitor services. Both of these agencies, with overlapping missions and constituencies competed for land and resources and Cedar Breaks was caught in the middle. The story continues next week.